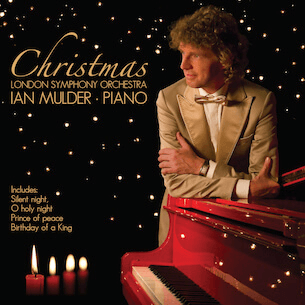 Composer and pianist Mulder recorded a new album titled: Christmas, with the London Symphony Orchestra. Mulder composed and arranged the music for the new CD which contains beautiful Christmas Carols such as: "O Holy Night", "O Come All Ye Faithful", "Silent Night", and "Angels We Have Heard On High". In addition to that, he composed new music for the Christmas season: "The Birthday Of A King", "Prince of Peace", and "Mary's Lullaby". Guest artist Andrea Bocelli sings a beautiful song called: "A choir of a thousand angels". Jan Mulder conducted the London Symphony Orchestra at Lyndhurst Hall in London and played the solo piano part simultaneously. Mulder's Christmas album sounds warm, very emotional and pleasant. Sheet music for piano is available here.